According to those in Europe (GPI), glass is one of the most environmentally friendly materials on the planet. In fact, when you recycle glass, you just end up with more glass that can be used once again as glass. By choosing glass for your packaging, you make it easier for your consumers to recycle it as well. Yet to get started first you need to know which type of glass to buy. Here is a guide on glass recycling for professional packaging. When you are selecting a type of glass for packaging, the primary goal is to preserve the product. The best glass will offer security and safety of your product throughout its lifecycle. However, you can’t overlook visual appeal. The way your packaging product looks on display can make all of the difference in selling your product. The allure and shine of glass sitting on a shelf simply cannot be overlooked for other materials, such as dull plastic. Another major factor is the environmental appeal. According to the Glass Packaging Institute, glass bottles are 100 percent recyclable without loss of quality. For every one ton of glass that is recycled, one ton of materials is saved. In addition, more than 80 percent of all glass that is taken to recycling is melted down into new glass. Choosing glass is the most eco-friendly way you can package your product. The use of glass is also a highly preferred method of packaging across multiple markets. In some cases, such as Essential Oils, the products demand glass for its inert properties. In other cases, glass provides an oxygen barrier. And, at times, glass is chosen for its hand weight and premium feel. In fact, there has yet to be a better and more secure way to store reactive products than in glass bottles. There is also an integrity to the use of glass for packaging that cannot be overcome by other materials. Add that to the fact that glass can be recycled so easily, and you have a winner in the packaging department. Plus, you can choose to use recycled glass for your product packaging outright. This helps your company take the eco-friendly approach, which is a winner for many consumer groups. 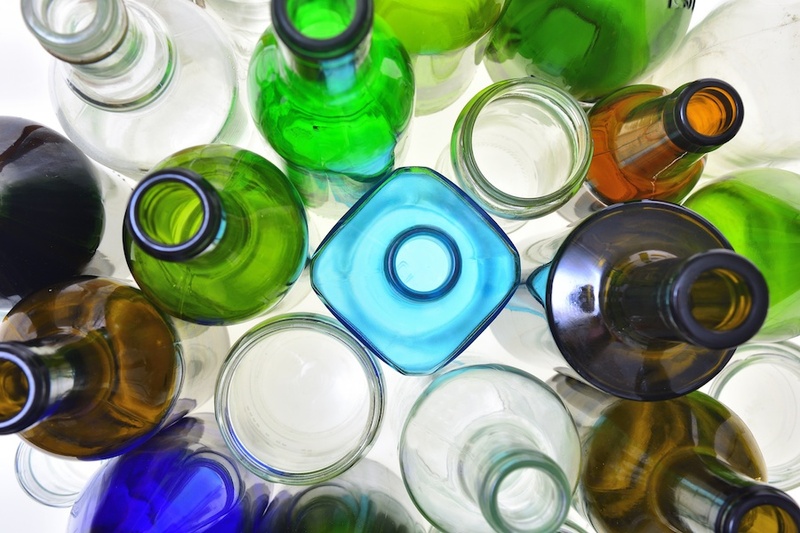 The percentage of recycled glass used in new bottles production varies. Make sure to ask a potential bottle supplier for their recycled glass composition or you can contact Carow Packaging who has already sourced a supplier that uses a staggering 50% post-consumer recycled glass in their bottles. 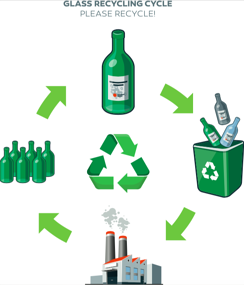 By using recycled glass and promoting recycling of your own product, you are covering both of your recycling bases. If your goal is to work with packaging that is recyclable glass, start by considering the end factor. For example, with glass, you do not have to remove labels in order to recycle it. Therefore, affixing a label to a glass bottle should not be an issue. In addition, when the glass is recycled, it is divided according to color. So the bigger concern may be which color of glass you are going to go with. Can you safely use recycled glass for your essential oils? Recycled glass packaging is wholly safe for the use of food products, essential oils, beverages, and construction materials after it has been processed. You do not have to worry about cross-contamination when using domestic recycled glass. In addition, the Food and Drug Administration has approved the process of recycling to be safe for consumers for your added protection. Back to the color factor, which is a more important consideration when choosing recycled glass. The color of the glass matters unless you are using single-stream recycling. In that instance, the colored glass is separated for the consumer. As for the best color for your company, take into consideration the product that is going into the bottle. You may need to choose a color that protects the product from light, heat, and other environmental issues. Or, you may select clear glass so that the end user can see how much product is remaining in the bottle. You can also choose a glass color that compliments your company logo and brand image. All recyclable glass will fall into one of these categories. The codes are used to facilitate the recycling process. By being able to look at the codes quickly, recycling is easier and more productive. Every country either uses existing codes or adopts their own. Ultimately, when you decide on a particular type of packaging, you want to get the best value for your money. You want to invest in packaging that protects the safety of your product and the convenience for your customers. By going with glass, you reach all of those goals. At the same time, recycled glass is an environmentally sustainable option that helps your company do its part to take care of the planet. If you are considering recycled glass packaging but still need more information let us help you. Contact Carow Packaging for for additional advice. We look forward to talking with you about your packaging needs.